Art uniquely transforms those who create and those who respond. Art plays a vital role in a general liberal arts education. Studio experiences develop the creative and artistic skills necessary for mastery of established styles and exploration of new ones. Art history provides an appreciation and understanding of our visual cultural heritage. 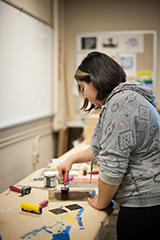 Art courses reward students with an introduction to a lifetime appreciation of the arts.